Treating Diabetes in Cats. Choosing a Blood Glucose Monitor for your cat, things to look for, where to buy one. There are a few blood glucose monitors specifically for cats - but you can use the blood glucose monitors made for humans too. UPDATE FEBRUARY 2019: When I first wrote this, there wasn't a blood glucose monitor designed just for cats. But things have moved on and now there are a few on the market. I've had a email from Mandy, letting me know about Alphatrak pet glucometers. I have not used one of these so cannot comment. Please let me know if you have used one and how you found it! Just Google "Blood glucose monitors for cats" and you'll find details of the Alphatrak, and some others too. As with all things, shop around. Thanks for getting in touch Mandy! At first glance, the cat-specific ones do seem to be expensive. However if you can't afford it, remember people have used human blood glucose monitors very successfully on their pets for decades. I only ever used a human blood glucose monitors. One that only requires a small blood drop to get a reading. A monitor that doesn’t require you to hold it at a specific angle while collecting your blood drop. A monitor with as few parts as possible - preferably just the monitor itself and the blood strips. A small monitor - you are going to be putting this close to your cat’s head so you don’t want something the size of a dinner plate! A monitor that doesn’t make loads of sound - again you’re going close to your cat’s head with it! Check the price of the blood strips - you will only purchase the monitor once, but you will have to buy replacement blood strips. 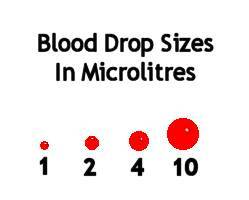 The picture above is to give you an indication of the size of blood drops required for monitors. It’s a little hard to do on a computer screen, but it should give you a rough guide. Blood drops are measure in microlitres, which is a millionth of a litre.I wouldn’t go for any monitor that needed a blood drop bigger than two microlitres. The monitor I have now is the second blood sugar monitor I bought. The first one was too big, and also had too many bits to it. You had to put this into that and slot the other bit into that bit - too much hassle for me! I bought both my monitors from my local Boots The Chemists - which was higly embarrassing! I have since found that you can purchase monitors off the internet - and you don’t need a prescription to buy one. A quick search on any search engine will bring up no end of suppliers. Whichever monitor you go for, do take the time to fill in the guarantee card that will come with it. It’s fun to fill in from your cat’s perspective, as it wants you to list hobbies etc (rolling in dirt, drinking pond water!) but on a serious note, my previous monitor was subject to a product recall and was replaced with no quibbles at all. If you ever had a problem with the monitor, which is highly unlikely, they would be obliged to replace it for you if it was under guarantee. 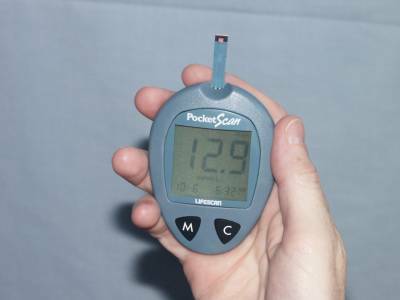 This picture is my current blood glucose monitor - a Johnson & Johnson PocketScan. I’ve always been happy with it - it’s small, very simple to use and it doesn’t mind which way up it’s held when collecting the blood drop. The blood glucose reading of 12.9 is Tokyo’s by the way! If you’re braver than me, just talk a walk to your local chemists and check out their displays of blood glucose meters. It doesn’t matter which one you choose, they are all equally accurate. Just bear in mind where you’ve got to use it! At the time of writing, the Freestyle Blood Glucose Monitoring System deserves a mention for its tiny tiny blood drop - one third of a microlitre. It costs about £40 and about £27 for 50 strips.